It’s always an adventure to visit an international grocery store. To see packages without a trace of English on them, or to find products you’ve never heard of. But sometimes, it can be just as overwhelming as it is fun. Thankfully, in Birmingham, we have several Asian markets to choose from. My personal favorite is about the size of your average supermarket and dwarfs the competition. While I love how many options they offer, the first few times I visited, I would purchase only one or two items because I was equal parts overwhelmed by the amount of products and a little nervous to buy a grocery cart full of totally new things. 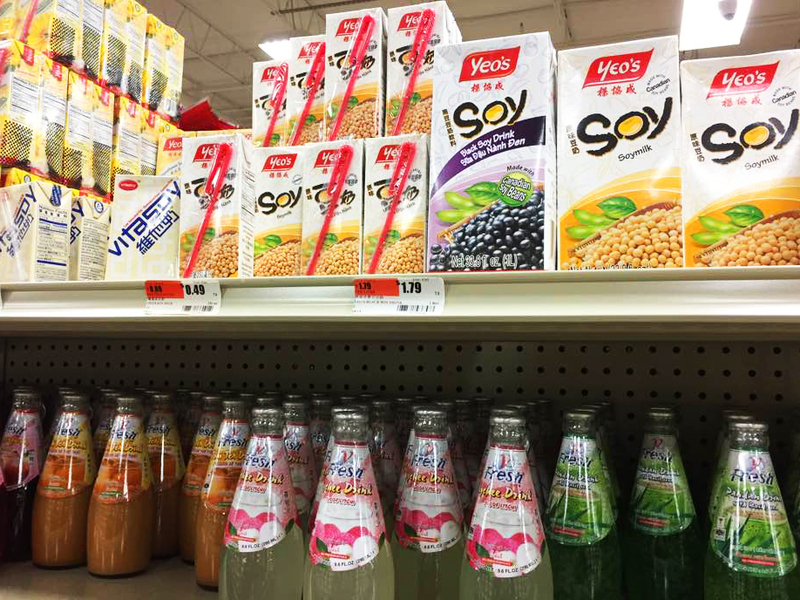 But one of the main reasons to visit an Asian market, besides just expanding your culinary horizons, is that they provide a huge range of familiar vegan-friendly products at a fraction of the prices found at regular grocery stores. This means you can happily fill your fridge, and pantry with wholesome, cheap foods during your next shopping trip. A staple for the many Asian cuisines, you can find just about every type of tofu imaginable in the refrigerated section. Soft, silken, firm, extra firm, baked, fried, puffed, you name it, they probably have it. I usually buy the firm tofu, which rings in at around $2.50 per container and has 19 ounces of tofu. That’s about one and a half times the amount of tofu, for two-thirds of the price at a regular grocery store. This past year has seen jackfruit grow in popularity, with recipes popping up everywhere using it as a meat-substitute. And while you can purchase it already seasoned and prepared in most health food stores, you can get the canned stuff for significantly cheaper and customize it as you wish. 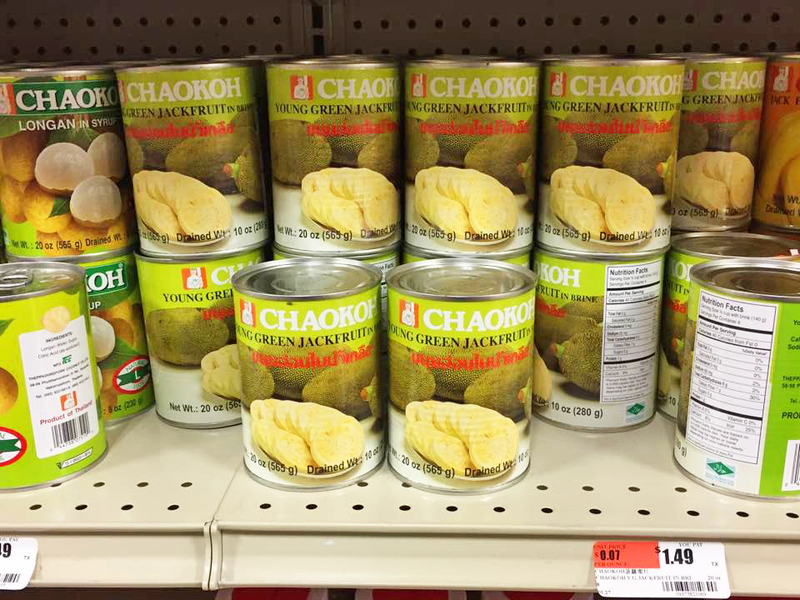 At my local store, the jackfruit is in the canned fruits section near the coconut milk. Be sure to get the canned jackfruit in brine and not in syrup. Each can has about two servings (at least for the amount Peter and I eat) and rings in around $1.49 a piece. Then you can easily shred the jackfruit and dress is up for tacos, a baked potato topper, or whatever your little vegan heart desires. Be warned, when buying soymilk at an Asian market, don’t be expecting the thin product from brands like Silk. Their non-dairy drink is very thick in comparison, with a much richer mouth-feel. It’s not something I would use for cooking or drinking straight, but a dollop in a mug of coffee does wonders, and it can make very moist baked goods. If you like the thick texture, most markets have adorable individual-size cartons, usually in fun flavors like chocolate or strawberry. 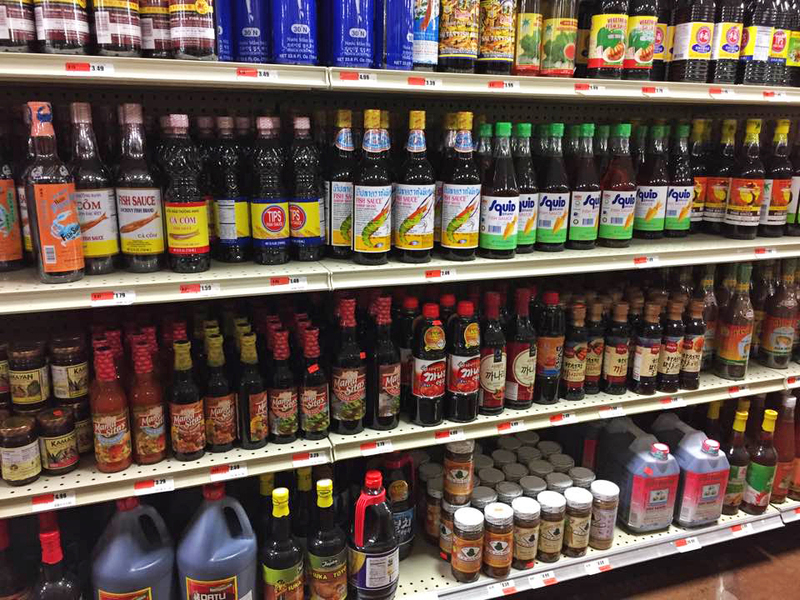 The majority of Asian grocery stores have an entire aisle dedicated to oils, vinegars, and various sauces or condiments. You can get cheaper versions of many commonplace products like oils (olive, canola, sesame) and vinegars (white, rice, apple cider). For sauces, if you’re like me and cook Asian food a lot, you can get huge bottles of soy sauce, sambal oelek, and sweet chili sauce for a serious bargain. And this is my favorite part of the store, not just because of the nice price points, but because there’s a world of new flavors to discover in the condiments aisle. 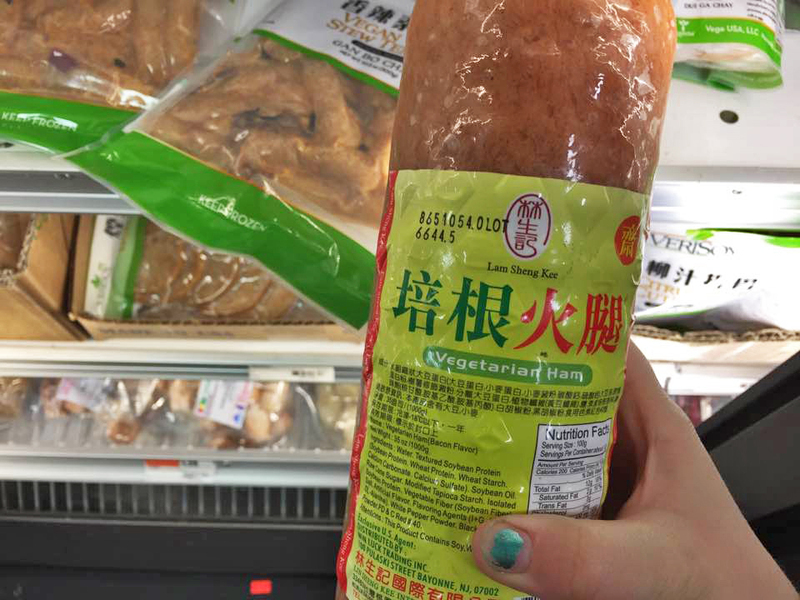 Besides products that contain fish or oyster sauce, most are vegan-friendly. Try out a new chili paste, curry sauce, or new stir-fry base with dinner tonight. You might just find a new favorite. Merry Christmas (and any other celebrated holiday) to all my readers! Peter and I just got back from a fantastic trip to Philadelphia, New York City, Brooklyn, and Salem. Between that and going to holiday festivities, it will be a few days before I start posting about the actual trip, but for now be satisfied with photos of pre-trip lunch in Atlanta at Kafenio. 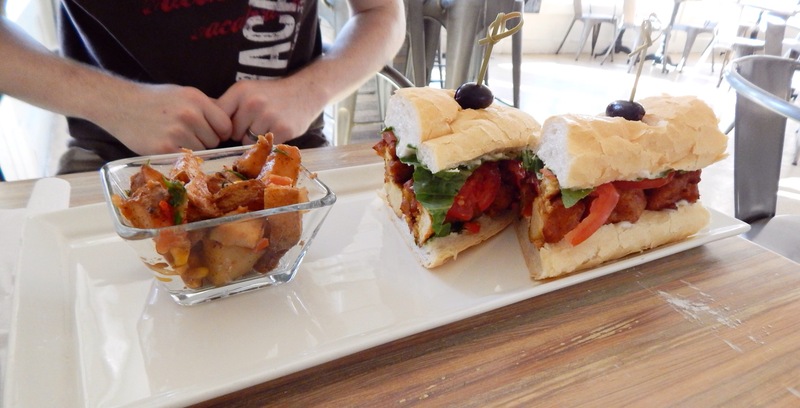 This quirky little Greek cafe is located a convenient five minutes from the airport and sports a large amount of vegan and vegetarian food. We were mostly just excited about the all-day breakfast. Peter ate the Atalanta (not a typo but the name of a Greek mythological huntress) omelette which was stuffed full of veggies and served with a side of cheese grits and toast. I partook in the vegan bowl which was piled high with hashbrowns, tofu scramble, and fresh vegetables. A great meal to start a trip full to the brim with good food! 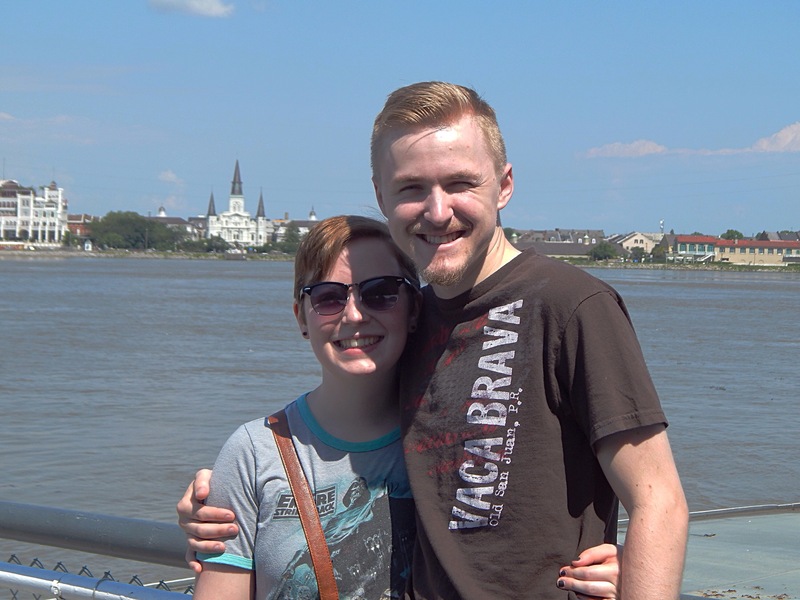 The first stop on our trip was New Orleans, the only city we had previously visited together. 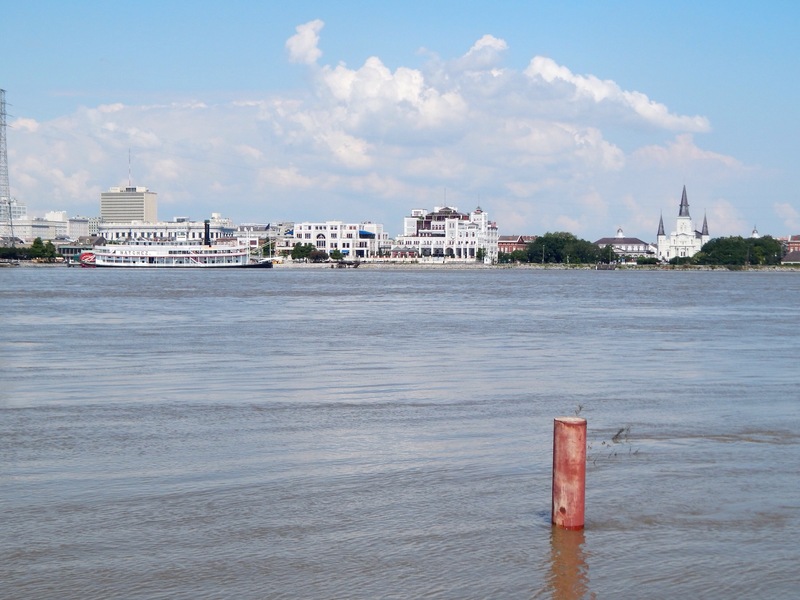 Most of the city’s cheap hotels were booked up for Jazz Fest, so we ended up staying across the river near Algier’s Point. Our hotel was about a 30 minute walk from the ferry, so we had a nice time strolling (and sweating in the 85+ degree weather) through the neighborhoods near the water. 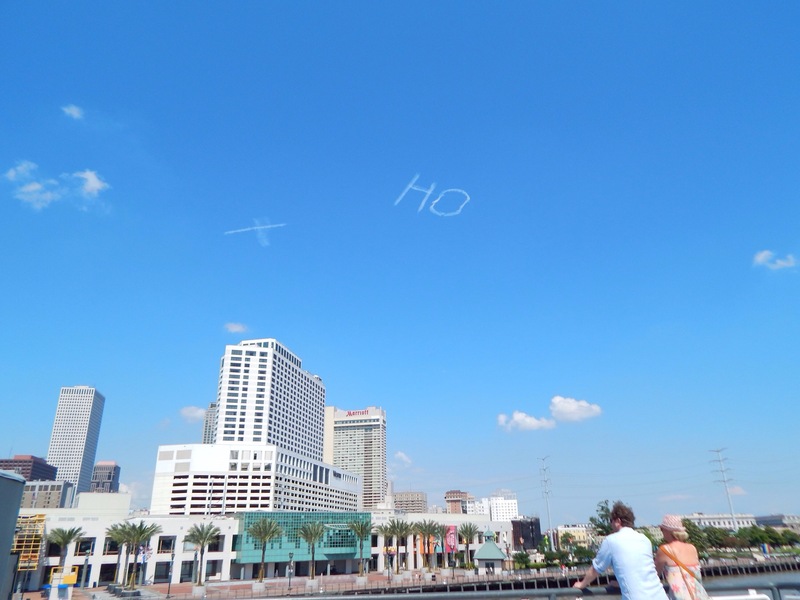 While riding the ferry, a plane was flying overhead trying to spell something. Or insult somebody, we weren’t quite sure. Hungry from our trek, we stopped in at the always delicious Dreamy Weenies. We were shocked that the place was empty, apparently due to the Jazz Fest. The poor guy behind the cash register was so bored and quizzed us about where we were from and what we were doing in the city. 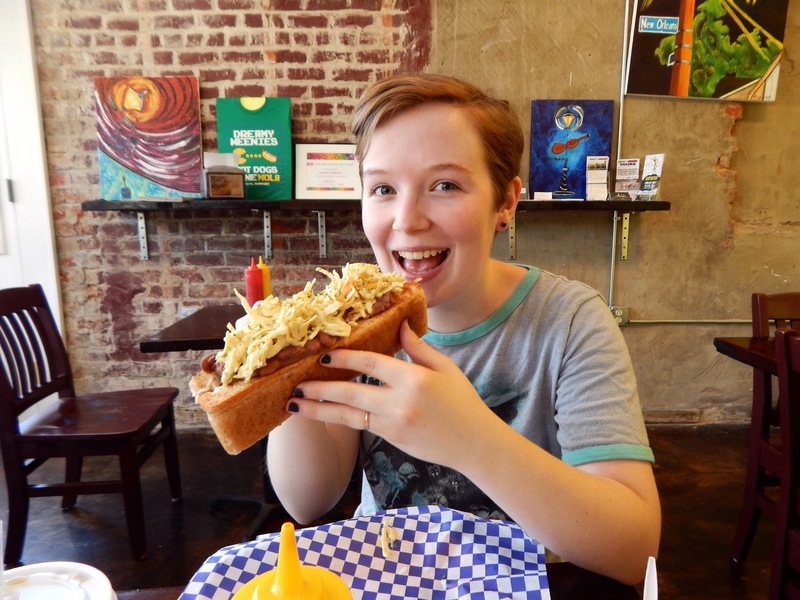 I got a kielbasa dog topped with slaw and red beans and rice. 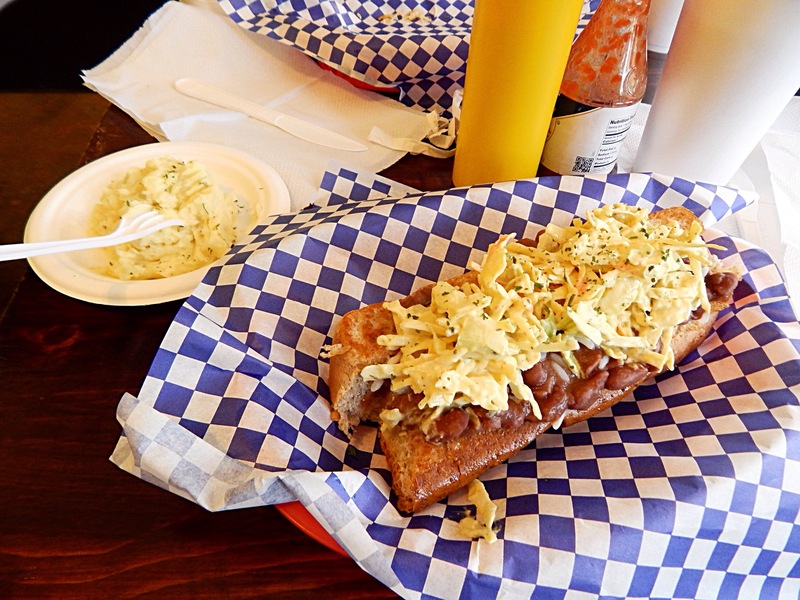 Peter got a smoked “chicken” dog with sour cream and cheese. 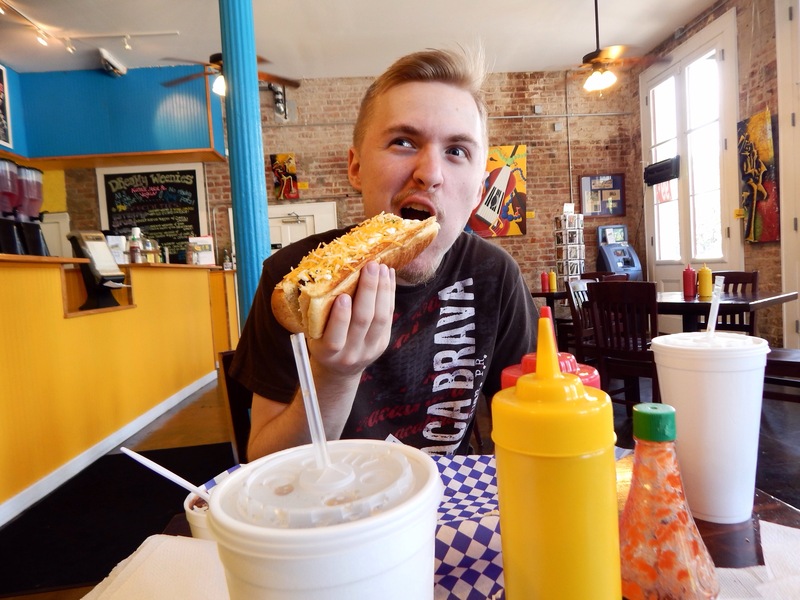 The majority of our day was spent taking the Saints and Sinners tour offered by French Quarter Phantoms. This is the second tour we’ve taken from this company and both have been fantastic. The tour guide took us all through the French Quarter while regalling us with tales about the beginnings of New Orleans, various stories of its’ seedy history, and even told us about a woman who may become the city’s first saint. 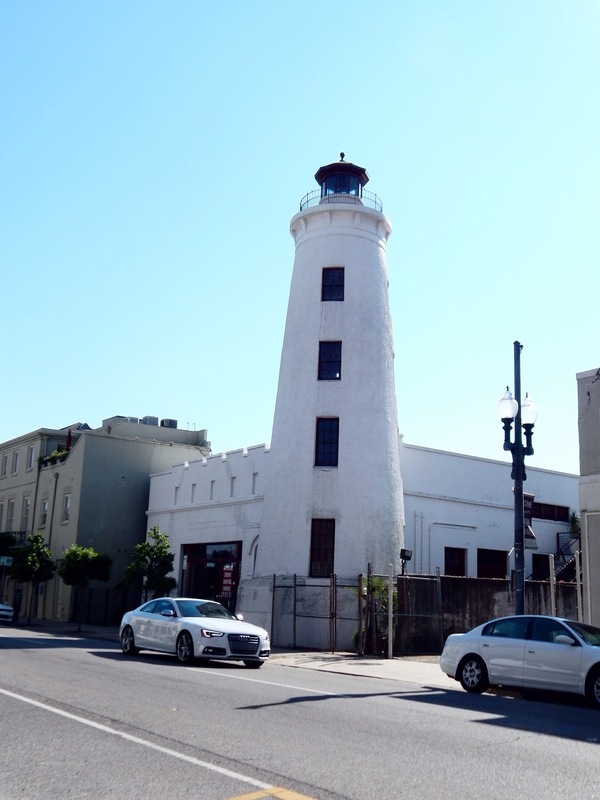 While wandering the French Quarter we also saw this awesome lighthouse for rent. Since we’ve previously discussed moving to NOLA, I’m totally down with the idea of us living in a lighthouse there. Dinner was at Seed near the edge of town. We dined on beignets (not pictured) to start and for dinner Peter had the southern fried tofu poboy and I had the walnut taco salad with seed gumbo. 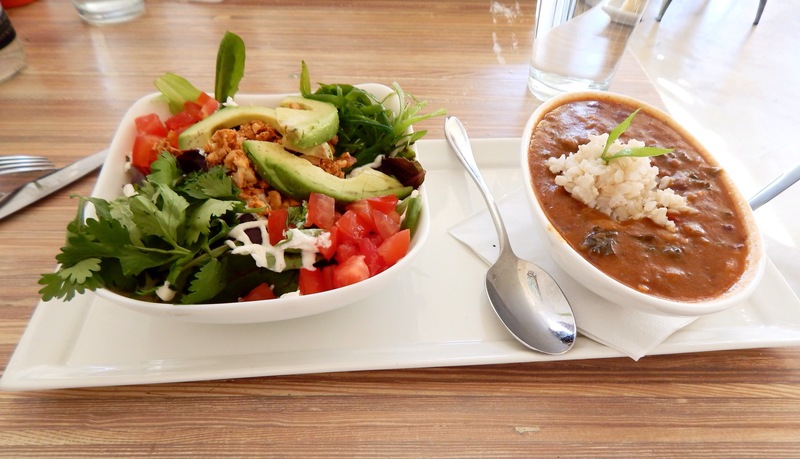 I love this restaurant, not just because of the great food and friendly servers, but because we can enjoy New Orleans classics while still sticking with an animal-friendly lifestyle. I hope everyone had a nice Easter! Mine was spent on the way back from Rochester NY from a visit to my sister, which will culminate in a delcious post tomorrow highlighting our meals. Back to today, which involved some experimenting. While I would not classify my attempt at making a copycat tofu recipe as a failure, it definitely needs tweaking before being revealed to occasionally harshly opinionated public, aka you readers. 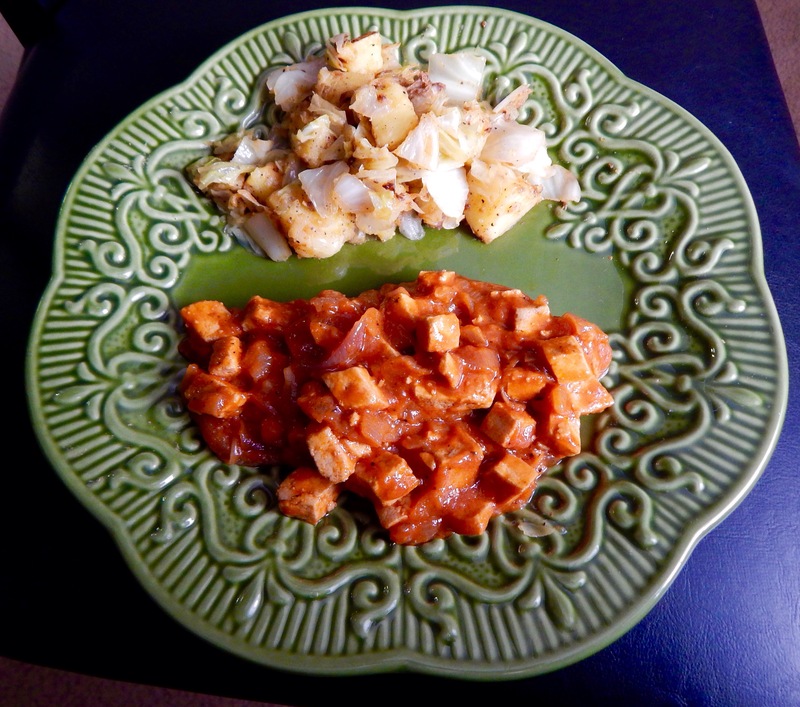 I’ve always loved Wildwoods Savory Baked Tofu, enough that I happily eat it straight cold from the package. I glanced at the ingredients one day and was surprised to see all the ingredients were things I had in my fridge and pantry: tofu, soy sauce, apple cider vinegar, mustard, apple juice, sesame oil, onion powder, and garlic powder. I’m now on a mission to recreate this amazing tofu with such a simple (and cheap!) ingredients list. I made some today, guessing measurements based on the listed order of the ingredients. After baking, the texture was spot on but the flavor wasn’t perfect. The marinade smelled like the real deal, but the finished product lacked too much flavor for me to be happy. My next grocery trip will involve buying a few packages of tofu though because I am determined to have this recipe prepared for next week. As a bonus, here’s a picture of the lone bunny left from some Easter chocolates I made.